My first experience with split pea soup will definitely be my last after trying this pot of grossness. Don't get me wrong, I like peas, and I love sweet potatoes...but this was just horrible. I almost wonder if the color had something to do with it, which wasn't a bright, vibrant green...but a murky, vomit-colored green (okay, now I've probably killed this for everyone). As I expected, the miso added a nice savory saltiness, but on the other hand, I think the choice of herb used in this dish (tarragon) was a wrong one. The soup had a sweetness to it, and something about the tarragon just did not go well with that. I'm very mad at myself (for experimenting, I guess), but I threw the whole pot away after taking the photo. Sad, sad, sad. And to think, I ran around the city for two days looking for yellow miso (which of course now I have a full tub of). Make again? Never. 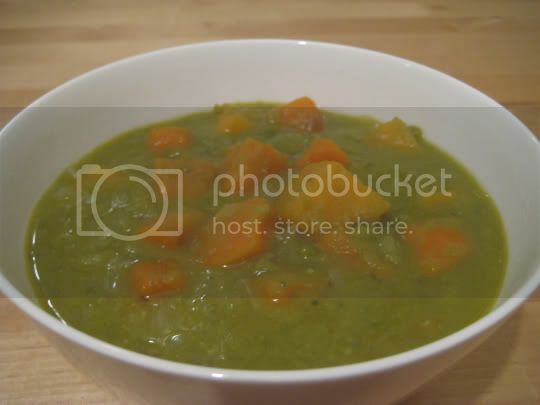 Split pea soup has been eternally ruined for me.